Ford Motor Company has announced that all new 2017 Ford models will have available SYNC3, Apple CarPlay and Android Auto compatibility. Ford is further enhancing their SYNC voice-activated communications system with these popular smartphone integrations. All 2017 model year Ford cars, SUVs, light trucks and electric vehicles will have these available options. As part of Ford’s efforts to continue to provide convenient, easy to use technologies the new SYNC 3 system features all new hardware and software for faster, intuitive performance and a more conversational voice. 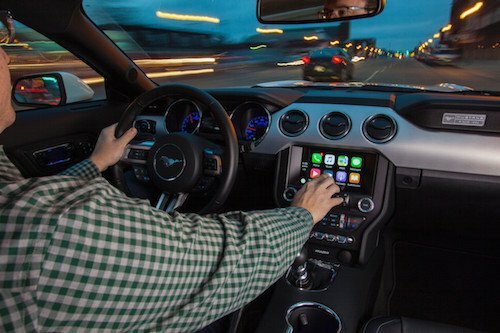 With new Android Auto and Apple CarPlay integration Ford drivers will be able to easily connect to their smartphones for access to a variety of features. Other convenient apps such as Spotify, Pandora, Ford PASS, AccuWeather and AAA member services have also been added through the SYNC system. If you would like to learn more about any of the new Ford technologies available on upcoming 2017 models please contact our Ford Dealership near San Francisco, CA. Our Ford experts are ready to answer your questions and explain why new Ford vehicles offer more connectivity and convenience than ever before.